Makin Tua makin eksis aja nih salah satu legenda Icon penting Speed/Thrash, Groove Metal asli Yonkers, New York yang eksis sejak tahun 1981, ANTHRAX !! memang pantas menjadi Icon penting perkembangan Musik Cadas internasional tetap menganggap mereka sebagai salah satu " Pioner " Penting ! 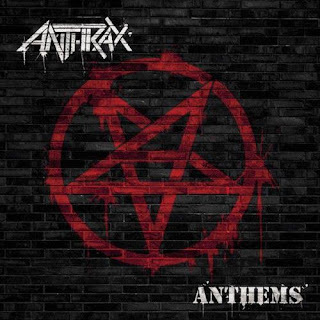 yang pasti udah pada tau sapa Anthrax ini deh, makanya Gw ga banyak cerita tentang nih band aja hehehehe ... " Anthems " EP adalah menjadi Materi terakhir bersama Gitaris Rob Caggiano sejak dirinya bergabung dengan Anthrax tahun 2001 hingga Tahun 2005, kemudian kembali lagi tahun 2007 hingga menggarap Ep ini dan saat ini kabarnya digantikan sementara oleh Gitaris Shadow Fall, Jon Donais, sebuah Rilisan yang ga baru2 amat memuat lagu2 Anthrax tentunya, ini hanya sebuah album dengan materi cover version bentuk penghormatan pada sosok influentalis bagi karir bermusik Anthrax tentunya. kesannya memang Member Anthrax seperti sedang ingin " Having Fun " saja, Anthrax juga menggandeng Keyboardis Pioner, Fred Mandel, yang pernah bermain untuk Alice Cooper, Queen, Elton John, Cheap Trick, Supertramp dan Pink Floyd’s pada Track " Smokin " nya Boston yang bagi Drummer Charlie Benante merasakan istimewa dengan track dari album pertama Boston yang Nge-Thrash ! materi Ep ini sendiri dikerjakan kurun waktu tahun 2012 saat Anthrax disibukkan dengan jadwal Tour-nya. dikerjakan di studio Charlie Benante, Ruston’s New York studio, dan konsepnya sendiri ditulis pada sela sela akhir summer’s Mayhem Tour. Track awal " Anthem " tentunya sangat tidak asing lagi bagi penikmat Canadian progressive rock Legendaris seperti RUSH ! band dengan musisi handal dan komposisi mereka kadang cukup rumit dengan irama yang tidak konvensional seperti 7/8 atau sinkopasi, juga solo gitar dan lirik bertemakan serius telah diaransemen ulang dalam versi Anthrax tanpa mengubah banyak konsep aslinya, penguasaan karakter Vocalis Joey Belladonna lumayan bisa meleburkan karakternya terasa cukup enjoy ! begitu juga permainan bassis Frank Bello lebih menikmati Sentuhan Klasiknya. setelah itu " Jailbreak " nyaThin Lizzy gantian dikomposisi ulang, band legendaris asal Dublin, Ireland ini masih dikenal dengan gaya Rockin Glamournya. yang lebih menjiwai Attitude klasiknya lagi saat Anthrax membawakan kembali salah satu Track fenomenal milik AC/DC " T.N.T ", Band hard rock Asal Sydney, bentukan rhythm guitarist Malcolm Young dan saudaranya lead guitarist Angus Young, masih begitu asli pembawaannya tetap terjaga, liat bagaimana karakter vokal Joey Belladonna mampu mengikuti cengkok Vocalis Bon Scott hehehe ... setelah itu " Big Eyes " Milik legendaris American rock asal Rockford, Illinois, CHEAP TRICK !, kemudian " Keep on Runnin " nya JOURNEY, band bentukan Gitaris karismatik Santana ! dan 2 Track terakhir adalah lagu " Crawl " dalam 2 versi, sebuah lagu yang didaur ulang dari materi album sebelumnya " Worship Music ", masih cukup mengena memorability-nya. well inilah gaya Pioner membawakan kembali sang legendaris, Metal To classic banget, sehingga album ini bisa menjadi hiburan tersendiri bagi Fans Anthrax untuk ga selalu mendengarkan lagu2 mereka terasa keras !, selain itu Label Nuclear Blast Records memegang lisensi perilisan Ep ini untuk kawasan Eropa dan sekitarnya. “These are all bands I grew up with and have listened to forever. It’s just great music. I had fun singing these songs and I was happy recording together with Anthrax, doing classic rock songs. Fun stuff!” itu adalah komentar sang Vocalis tentang Album Daur Ulang ini. A great, matured and honourable effort from the boys that I personally thought they could not achieve, but have been pleasantly surprised. Makin Old increasingly exist aja nih important one legend Icon Speed ? ?/ Thrash, Groove Metal native Yonkers, New York which existed since 1981, Anthrax!! indeed deserve Rocks Music Icon important international developments continue to consider them as one of the "pioneers" Important! who would've at Anthrax's sapa tau deh, so Gw ga lot of stories about bands aja nih hehehehe ... "Anthems" EP is a material with guitarist Rob Caggiano last since he joined Anthrax 2001 to 2005, then returned in 2007 to work on this EP, and is now reportedly being replaced temporarily by Shadow Fall Guitarist Jon Donais, a release that ga baru2 very load lagu2 Anthrax course, this is just an album with cover versions of material form of homage to the figure influentalis for Anthrax music career course. impression is Member Anthrax as being like "Having Fun" only, Anthrax also took keyboardist Pioner, Fred Mandel, who played for Alice Cooper, Queen, Elton John, Cheap Trick, Supertramp and Pink Floyd's on Track "Smokin" his Boston that the Drummer Charlie Benante feel special with a track from the first album that NGE Boston-Thrash! Ep material itself is done during the years 2012 when Anthrax busy with her tour schedule. done in the studio Charlie Benante, Ruston's New York studio, and the concept itself is written in the sidelines late summer's Mayhem Tour. Track the beginning of "Anthem" is certainly very familiar to lovers of the legendary Canadian progressive rock like Rush! band with excellent musicians and their composition is sometimes quite tricky with unconventional rhythms like 7/8 or syncopation, as well as guitar solos and lyrics to the theme seriously been re-arranged version of Anthrax without changing a lot of the original concept, mastery of characters Vocalis Joey Belladonna could meld her character bearable feels quite enjoy! as well as games get more bassist Frank Bello Classically touch. after that "Jailbreak" nyaThin composed Lizzy turns over, the band legendary Dublin, Ireland is still known as Rockin style glamor. Attitude is more animating classics again when Anthrax brings back one phenomenal track belongs to AC / DC "TNT", Origin Sydney hard rock band, formed by rhythm guitarist Malcolm Young and his brother lead guitarist Angus Young, yet so genuine demeanor will be maintained, how the character clay vocalist Joey Belladonna able to follow the twisted Vocalis Bon Scott hehehe ... after that "Big Eyes" Belongs to the legendary American rock band Rockford, Illinois, CHEAP TRICK!, then "Keep on Runnin 'his JOURNEY, charismatic band formed by guitarist Santana! and 2 Track last song "Crawl" in 2 versions, a song from the recycled material previous album "Worship Music", is still wearing his memorability. well this is to bring back the style of the legendary pioneers, Metal To classic really, so this album could be its own entertainment for fans of Anthrax for ga always listen lagu2 they feel hard!, besides Label Nuclear Blast Records holds the license for the release of this EP Europe and beyond . "These are all bands I grew up with and have Listened to forever. It's just great music. I had fun singing these songs and I was happy recording together with Anthrax, doing classic rock songs. Fun stuff! "Was the comment about the album Recycled Vocalis this. A great, matured and Honourable effort from the boys that I personally thought they could not Achieve, but have been pleasantly surprised.